An easy and adaptable broth microdilution method for screening antifungal compounds and extracts. de-Souza-Silva, C. M., Guilhelmelli, F., Zamith-Miranda, D., de Oliveira, M. A., Nosanchuk, J. D., Silva-Pereira, I., Albuquerque, P. Broth Microdilution In Vitro Screening: An Easy and Fast Method to Detect New Antifungal Compounds. J. Vis. Exp. (132), e57127, doi:10.3791/57127 (2018). Fungal infections have become an important medical condition in the last decades, but the number of available antifungal drugs is limited. In this scenario, the search for new antifungal drugs is necessary. The protocol reported here details a method to screen peptides for their antifungal properties. It is based on the broth microdilution susceptibility test from the Clinical and Laboratory Standards Institute (CLSI) M27-A3 guidelines with modifications to suit the research of antimicrobial peptides as potential new antifungals. This protocol describes a functional assay to evaluate the activity of antifungal compounds and may be easily modified to suit any particular class of molecules under investigation. Since the assays are performed in 96-well plates using small volumes, a large-scale screening can be completed in a short amount of time, especially if carried out in an automation setting. This procedure illustrates how a standardized and adjustable clinical protocol can help the bench-work pursuit of new molecules to improve the therapy of fungal diseases. Fungal infections have become an important medical concern in recent decades, having considerably increased mainly due to a rise in the number of immunocompromised individuals such as those undergoing cancer treatment and those living with HIV/AIDS or transplanted organs1,2. However, a very limited array of available antifungal drugs and the increasing number of reports on fungal resistance to them contribute to the major problems regarding the therapeutics of systemic mycoses3. A potential source of new antifungal compounds are antimicrobial peptides (AMPs), small cationic peptides produced by many organisms as part of their innate immune response to infection4. Nevertheless, the screening method to test these compounds against fungal pathogens is not standardized. Different procedures have been used to assess the antifungal activity of AMPs, sometimes for the same model microorganism5,6,7. These differences and the lack of detail in some protocols complicate comparisons between compounds and hampers reproducibility. One way to standardize the testing of new drug candidates is to follow guidelines used to define antifungal susceptibility in clinical settings, such as the Clinical and Laboratory Standards Institute (CLSI) M27-A3 guidelines. However, these antifungal sensitivity tests are too restrictive, and do not take into consideration variation in metabolism across species, as they were only established for a few select agents. For example, they do not take into account the metabolic needs of non-fermenting yeasts. This protocol allows the assessment of activity of prospective antifungal compounds, and is implemented here for the search for antifungal peptides. It is based on the broth microdilution susceptibility test from the CLSI M27-A3 guidelines with modifications that optimize the screening of new compounds8,9. These changes allow for the use of small amounts of compound, variations in temperature or initial inoculum, and different media for optimal pre-test growth, while standardizing the results with the use of reference antifungals as controls. This method, with the use of multi-well culture plates, makes it possible to quickly and reliably screen a large number of compounds. Due to its inherent flexibility, this protocol can be used with different chemical classes of compounds and against other microorganisms, with few adaptations. Prepare 2X Roswell Park Memorial Institute (RPMI) 1640 medium, phosphate buffered saline (PBS), Sabouraud dextrose broth, and Sabouraud dextrose agar as per Table 1. Store all fungal strains as frozen stocks in 35% glycerol at -80 °C, until needed. Perform the following steps before each experiment. Thaw a stock vial and transfer 200 µL to 10 mL of Sabouraud dextrose broth in a sterile 50 mL polypropylene tube with a cap and culture overnight at 30 °C with agitation (200 rpm). Remember to incline the tube and leave the cap slightly open for better aeration of the culture. Scrape the frozen surface of a stock vial. Plate the cells onto Sabouraud dextrose agar plates and incubate for 48 h at 30 °C. After visible growth of isolated colonies, keep the plates in the refrigerator (4 °C) sealed with paraffin film for up to 15 days. Collect a medium-sized isolated colony from the plate using a sterile toothpick or sterile inoculating loop and inoculate 10 mL of Sabouraud dextrose broth in a sterile 50 mL conical tube. Incubate for approximately 24 h at 30 °C under agitation (200 rpm). Do not exceed the 24 h incubation. Remember to incline the tube and leave the cap slightly open for better aeration. It is always good to standardize the growth stage of the cells before each test, since this is an important factor affecting antimicrobial resistance. NOTE: Both fungi were grown at 30 °C for rapid propagation in our experiments, but the temperature can be changed to reflect the aims of the study, for example clinical treatment (37 °C). Most importantly, this initial incubation time should be established beforehand for each fungal isolate and maintained throughout all the tests to ensure reproducibility. After fungal growth, collect the cells by centrifuging the conical tubes at 1,200 x g for 5 min at room temperature. Discard the supernatant and add 10 mL of PBS. Resuspend the cells and centrifuge again at 1,200 x g for 5 min at room temperature. Repeat the PBS wash and centrifugation twice more. After the third wash, resuspend the cells in 5 mL (according to the pellet size) of 2X RPMI-1640 medium. Prepare 1 mL of a 1:100 or 1:1,000 dilution in a microcentrifuge tube (depending on the turbidity of the cell suspension). Aliquot 10 µL of this dilution, place it in a hemocytometer chamber and count the total number of cells in the four corner quadrants under the microscope. Calculate the concentration by the formula: (total cell number/4) x dilution factor x 104 (chamber dilution constant). Consider a 100% viability if viability counts and growth conditions have been systematically correlated for the isolate being studied. NOTE: The standardization and quality control of viability counts can be done by back-plating in accordance to the European Committee on Antimicrobial Susceptibility Testing (EUCAST) antifungal Minimum Inhibitory Concentration (MIC) method for yeasts10. If the growth/viability correlation has not been established for the isolate under study, measure the fungal viability by counting live cells in a hemocytometer with the aid of dyes that selectively color dead cells, such as phloxine B11, trypan blue12, or Janus Green13. Use the fungal cells for this protocol only if the viability of the population at this point is 90% or above. NOTE: Dead/alive dyes may not work well with the fungus of choice. Please test them before use. For example, the trypan blue dye does not work well with C. neoformans. After that, prepare the cell suspensions in 2X RPMI-1640 medium (2X adjusted inoculum in RPMI-1640 medium). For 96-well plates consider a volume of 5 mL for each plate. For all C. albicans strains, prepare a stock cell suspension of 4 x 103 cells/mL. This concentration is 2X of the final cell concentration in each well (2 x 103 cells/mL). For C. neoformans strains, prepare a stock culture of cells 2 x 104 cells/mL. This concentration is twice the final cell concentration in each well (1 x 104 cells/mL). For other fungi, test with a known antifungal which concentration will be ideal for the particular study in relation to the incubation time. Take metabolism and duplication time of the fungus into consideration. Store the lyophilized peptides at -20 °C, and dissolve them in deionized water before each experiment. The maximum storage time once dissolved in water will depend on the nature of each peptide. Prepare aliquots of twice the highest final concentration tested in the assay (2X). Ideally, prepare a small number of aliquots with enough peptide for one time use to avoid freeze-thaw cycles. NOTE: The choice of concentration should be based on literature and the properties of the peptide. It is recommended to start the serial dilutions with approximately 100 µM of the peptide, and then decrease or increase this concentration range depending on the obtained results. For those diluted in water: prepare a 2X solution of the highest concentration of the analysis (see Section 5: Antifungal Assay for the dilution steps). For C. albicans strains, prepare a solution of 128 µg/mL of fluconazole or 128 µg/mL of caspofungin. The plate concentration for both will be 64 µg/mL. For C. neoformans strains, prepare a solution of 32 µg/mL of amphotericin B (water-soluble solution). The plate concentration will be 16 µg/mL. NOTE: Normally amphotericin B is diluted in dimethyl sulfoxide (DMSO), since this anti-fungal is poorly soluble in water. However, there are water-soluble amphotericin B preparations commercially available. For antifungals diluted in an organic solvent: prepare a 100X stock solution in DMSO, then dilute it to 10X in water for use. NOTE: Thus, in the well, the final concentration of DMSO will not exceed 1%. A well where the fungus will grow in media containing 1% DMSO as control is required given that some fungi do not tolerate well this concentration of the solvent. Remember that DMSO is photosensitive, so cover the plate with foil or place it in a dark chamber for the duration of the incubation period. NOTE: In vitro antifungal assays are performed based on the broth microdilution susceptibility test from Clinical and Laboratory Standards Institute (CLSI) M27-A3 guidelines with some modifications. Prepare a two-fold serial dilution of each peptide and control antifungal in 96-well polystyrene microplates to a final volume of 50 µL. Using a pipette add 100 µL of the antifungal/peptide in the 2X concentration of the highest desired final concentration in columns 1-3, in row A. Using a multichannel pipette, add 50 µL of sterile water into the other wells, in rows B to H.
Remove 50 µL of the wells with the highest concentration (row A), transfer to the next well of the next concentration (row B) and homogenize. Repeat the above steps until the well with the lowest concentration and discard 50 µL of this well (row H). Leave Columns 11 and 12 (rows A, B, C) with only water for either blank control or negative/growth control. Add 50 µL of the 2X adjusted inoculum in RPMI-1640 medium to each well (columns 1-3 plus column 11 (negative/growth control)); the final concentration for C. albicans will be 2 x 103 cells/mL, and the final concentration for C. neoformans strains will be 104 cells/mL. Prepare blank controls (50 µL water + 50 µL 2X RPMI-1640 medium without cells) and negative/growth control (50 µL water + 50 µL adjusted inoculum 2X RPMI-1640 medium without antifungal), and load into the well plate as described above. Repeat the procedure for each compound to be tested and the chosen antifungal control (columns 4-10). 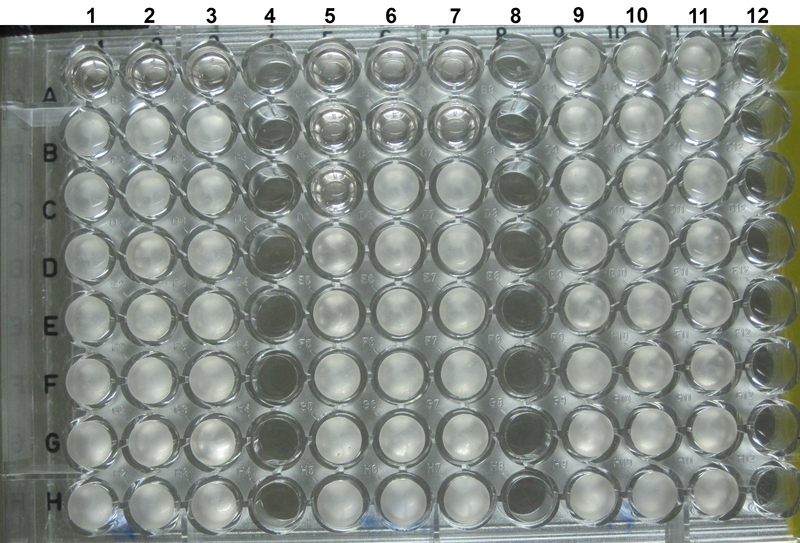 NOTE: The serial dilutions can be done vertically as the experiment below, or horizontally in the plate (i.e., if the number of dilutions of the given compound/extract that needs to be tested is eight or more). If the compounds, reference drugs, or any of its components are photosensitive, perform the assay in reduced light, cover the plates with foil, or place in a dark chamber during incubations. Consider the following optional recommendations. Seal the plate with a clear cover plate that permits gas exchange, as this helps reduce evaporation. Place the plate in a humid chamber; it will also help reduce evaporation. Incubate the plates at 37 °C for 24 h or 48 h for all C. albicans strains, and for 48 h with 200 rpm shaking for C. neoformans. The lower final volume (100 µL) ensures that no spillover occurs. NOTE: No significant difference was observed between MIC readings at 24 h and 48 h for C. albicans strains. Nonetheless, readings at 48 h are easier to visualize. Observe all wells, with the assistance of an inverted optical microscope, before the incubation period and after to verify changes in morphology as well as to check for signs of contamination. NOTE: Readings can be done visually and photographed at the end of the experiment. Before each reading, homogenize slightly the plate. The reads can also be performed by measuring its OD at 600 nm, if cell clumps or filamentation are not observed. Perform the experiments at least three times on separate dates. The MIC is defined as the lowest antimicrobial compound concentration that completely inhibits visible fungal growth at the end of the incubation period. Since the objective of this protocol is to have a fast method to screen potential antifungals, any well with clear media similar to the blank wells is considered a positive result, whereas any well with turbidity analogous to the negative/growth control wells is considered negative. However, if there is an interest in knowing whether a given AMP is fungistatic or fungicidal, the media from the positive wells can also be plated onto Sabouraud Dextrose Agar or checked by another viability test. Given that the mechanism of action of a novel compound is unknown, it is therefore essential to verify if the reference antifungal falls within the expected range for the fungal isolate (check official guidelines, tables, or data in literature) before checking the tested MIC for the compound (in this case, an AMP; Figure 1 and Figure 2) to confirm that conditions are ideal. If it does not fall in the respected range, it will be necessary to rerun the experiment since it will be impossible to determine if any changes observed are due solely to the tested compound. It is equally crucial to observe all wells under an optical microscope before and after the incubation period to check for changes in morphology and contamination. Figure 1. Evaluation of antifungal activity for three peptides against Cryptococcus neoformansusing the broth microdilution assay. Fungus concentration is at 1 x 104 cells/mL. Three peptides were tested (AMP1, columns 1 to 3; AMP2, columns 5 to 7; AMP3, columns 8 to 10) with concentrations ranging from 100 µM (row A) to 0.78 µM (row H). Growth control and blank are in columns 11 and 12, respectively. The image was acquired with a digital camera after 48 h of incubation. Please click here to view a larger version of this figure. Figure 2. Evaluation of antifungal activity for three peptides against Candida albicans using the broth microdilution assay. Fungus concentration is at 2 x 103 cells/mL. Three peptides were tested (AMP1, columns 1 to 3; AMP2, columns 4 to 6; AMP3, columns 7 to 9) with concentrations ranging from 100 µM (row A) to 0.78 µM (row H). 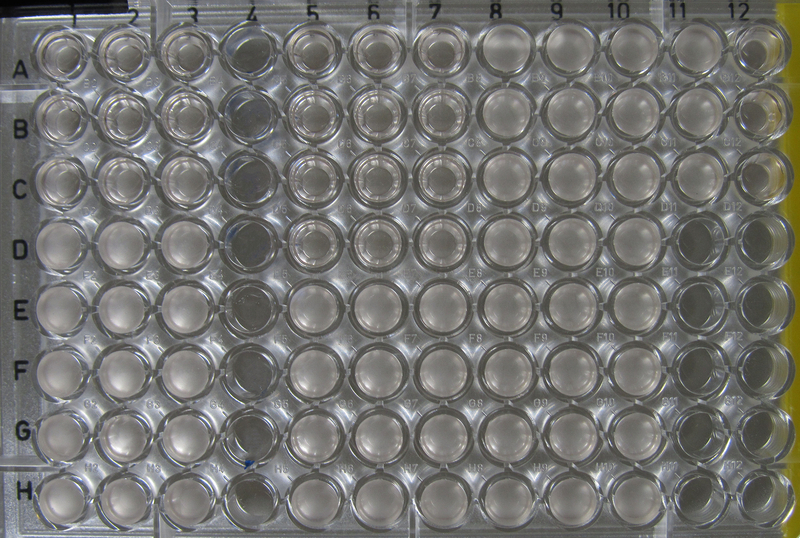 Growth control and blank were included in the assay, but do not appear in the photo. The image was acquired with a digital camera after 48 h of incubation. Please click here to view a larger version of this figure. As observed in Figure 1 and Figure 2, 48 h is enough time to distinguish positive and negative wells visually for both C. neoformans and C. albicans. It is noteworthy that the results for C. neoformans were obtained 24 h earlier than under the CSLI guidelines without the modifications. For each triplicate, the positive and negative well, and therefore the MIC for each compound, are easily discernible. This allows for fast MIC determination for multiple compounds as well as for choosing which molecules merit further investigation. 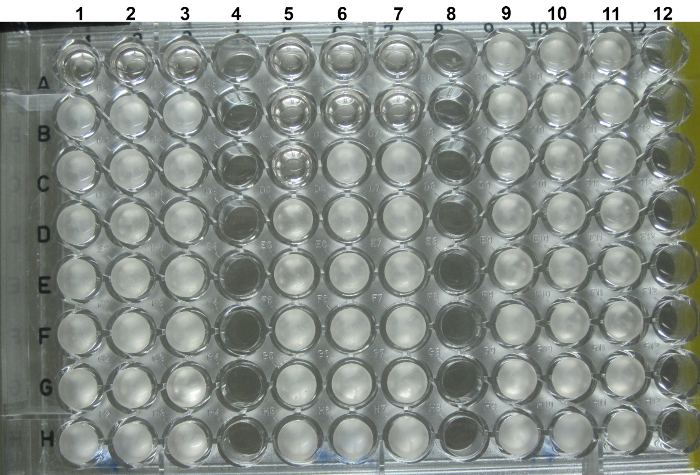 Meanwhile, Figure 3 is an example a poor result, likely from improper pipetting during the dilution step. This can be observed in column 5, row C, where a difference in C. neoformans growth is present across replicates (columns 5-7). Figure 3. Example of an error in technical replicates in a serial dilution assay. 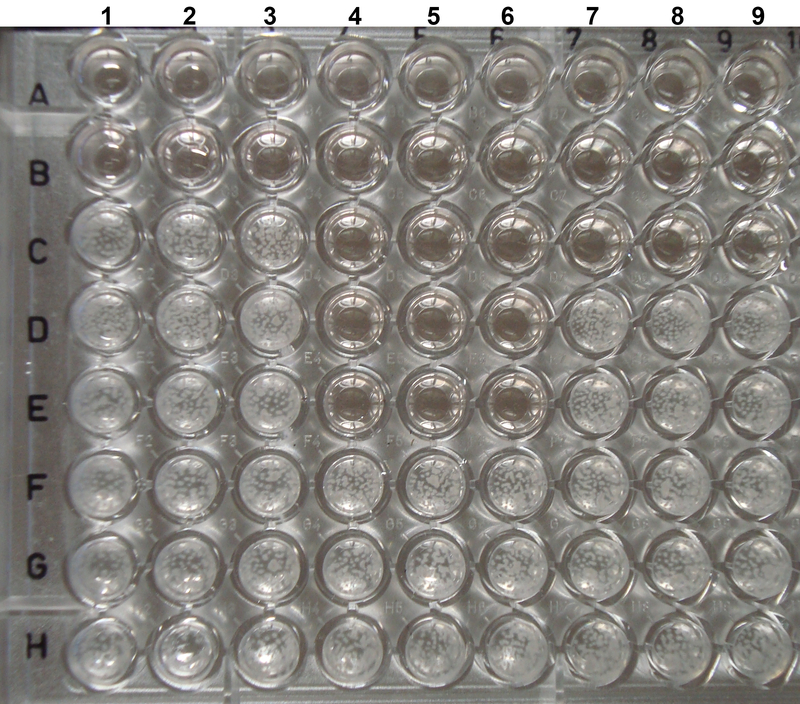 The image shows a serial dilution of AMPs ranging from 100 µM (row A) to 0.78 µM (row H). Differences in C. neoformans growth are present between replicates in columns 5-7, row C, most likely due to pipetting error during dilution preparation. Please click here to view a larger version of this figure. As for the interpretation of the plates, in Figure 1 there is an antifungal assay for three different AMPs against C. neoformans, located at columns 1-3 for AMP1, columns 5-7 for AMP2, and columns 8-10 for AMP3 with concentrations varying from 100 µM (row A) to 0.78 µM (row H). The negative/growth control was placed in column 11, rows A to C, while the blank control was placed in column 12, rows A to C. For AMP1 (columns 1-3, rows A-C) and AMP2 (columns 5-7, rows A-D), note that at a higher concentration the media is translucent and there is no visible growth. In contrast, at lower concentrations the wells are opaque (columns 1-3, rows D-H and columns 5-7, rows E-H). Therefore, row C is considered to contain the MIC for AMP1, while the MIC for AMP2 is in row D, that is to say, 25 µM and 12.5 µM, respectively. AMP3 will have to be re-evaluated, as the fungus grew in all concentrations tested. The reexamination for AMP3 is necessary to determine the cause, which could be that the test medium is interfering with the antifungal activity of the compound, microbial contamination, or a higher resistance of the fungus to the agent tested. For the last possibility, it will be necessary to increase the concentration range tested. As observed, the no-inhibition and control wells are homogeneous, so they could also be assessed by OD measurement at 600 nm. As for Figure 2, three distinct peptides were tested against C. albicans. The MICs for AMP1 (columns 1-3), AMP2 (columns 4-6), and AMP3 (columns 7-9) were 50 µM, 6 µM, and 25 µM, respectively. C. albicans, due to filamentation in the incubation temperature, can be observed in clumps in the no-inhibition and control wells, making it difficult to use OD measurement for reading. Sometimes, no growth is observed in the wells. This may be due to a toxin contamination in the media (in which case the growth controls also show no growth) or a higher susceptibility to the agent (in which case, the growth controls show growth). Accordingly, for the latter case, a decrease in the concentration range might be necessary. Sabouraud dextrose broth 15 g of the powder in 500 mL of distilled water. Sabouraud Dextrose Agar 32.5 g of the powder in 500 mL of distilled water. Table 1. Media and reagent preparation. Microdilution tests can analyze the potential antifungal activity of a target compound using small quantities of the compound, and at the same time test it in a range of concentrations. Accordingly, this protocol is recommended as a first step in screening for potential new antifungal compounds. The protocol presented here is based on the M27-A3 protocol, initially designed to aid in the selection of antifungal therapy in clinics, and can be adapted to a variety of new antifungal compounds. Overall, this protocol can focus on the physicochemical features of the extract or compound. For example, a potential candidate in the assay may falsely appear ineffective because a compound in the media may block its interaction with the fungal cell, such as the effect of RPMI on Histatin 514. In this case, an alternate medium for when the RPMI interferes, is Yeast Nitrogen Base (YNB) buffer with MOPS pH 715. The protocol also allows modifications in pre-growth conditions, inoculum concentration, incubation temperature, and for light-sensitive components, as long as the reference antifungal results are within the guidelines range. The reference antifungal should be based on the current therapy for the tested fungal species. Additionally, if there is a reference compound that is similar in nature to the potential drug – e.g., a known antimicrobial peptide with antifungal activity against the tested fungal model – it should be used as an additional reference control. Pre-growth conditions can be altered to suit the fungi and research needs. As in the protocol, C. neoformans and C. albicans were grown at 30 °C for better propagation. Nevertheless, this temperature can be changed depending on the fungi metabolism: for example, Paracoccidioides brasiliensis requires growth at 37 °C to maintain its yeast form, and due to its slow duplication rate, needs to be grown for 5-7 days. Therefore, it is essential to understand the fungus characteristics for testing a potential new drug. Furthermore, the age and stage of growth of the cells used should be defined according to the purpose of each study and, most importantly, the initial incubation time should be established beforehand and maintained throughout all the tests to ensure reproducibility. Equally, if the compound/extract, the reference antifungal, or diluent is sensitive to light, steps should be added to prevent its degradation, such as working with reduced light, covering the plates with foil, or placing the plates in a dark chamber during incubation times. Moreover, the edge effect and evaporation can be diminished with the addition of water in empty wells, by not using the outer wells and filling them with water, or by placing the plate in a humid chamber. One of the main limitations when using this method is its focus on the inhibitory activity of a tested compound, as opposed to distinguishing between fungicidal or fungistatic effects. Nevertheless, as the objective is a fast screening of the potential new antifungal, the initial visual assessment MIC with a clear positive ('clear/non-turbidity' wells) and a negative ('turbidity' wells) result, helps identify compounds of interest to study further, and therefore reducing the overall cost of screening for new compounds. Since the mechanism of action of these new compounds is unknown, this same protocol can be used to determine the compound's ability to inhibit or kill fungal cells by adding a few extra steps, such as plating the positive wells or using live/dead dyes. Other minor modifications can be added to use the protocol for a checkerboard titration assay to identify any synergistic effects of the compound with other drugs. Although the assay's reading is typically performed by visual analysis of fungal growth under different conditions compared to the growth in the well with no antifungal agent (negative/growth control), it can also be done by measuring its OD at 600 nm. However, although the OD measurement is accurate for homogenous solutions, some fungi grow in clumps thus breaking the precision of the method – e.g., Candida spp. as result of filamentation during the incubation period. On the other hand, one of the major advantages of the protocol described here, in comparison to the CLSI M27-A3 guidelines, is that it takes into account aeration of the media for non-fermenting fungi, like C. neoformans. Also, the CLSI guidelines only uses a small initial inoculum, thus requiring extended periods of incubation for fungal growth and MIC definition. Some studies have demonstrated that higher initials inoculums and shaking the plate during incubation improve the antifungal susceptibility tests without significant effects on MIC determination16,17. Our protocol can precisely determine the MIC for new compounds against C. neoformans in a shortened incubation period, within 48 h, compared to 72 h suggested by CLSI guidelines. Another advantage is that our protocol uses a 100 µL final volume instead of 200 µL recommended by CLSI guidelines, thus reducing the amount of the tested new compound required for the antifungal assay. However, evaporation of external wells may be a concern, but solutions already described in this section to reduce evaporation can be used without compromising the assay results. Additionally, by performing the dilutions directly in the plate, and thus bypassing the CLSI dilution guidelines to use microcentrifuge tubes, multichannel pipettes can be used. This protocol assembly is less complicated than the one in the CLSI guidelines, and also uses fewer materials. A critical step related to fungal cell preparation is the use of cells that are as fresh as possible. It is also crucial to perform all the assays with the cells at the same growth phase, since there are several reports in the literature about the differences in antifungal susceptibility when the culture ages18,19. A careful selection of reference strains is also essential. A very sensitive or rarely isolated species may not produce a clear picture of the antifungal potential. By the same token, it is helpful to avoid sub-culturing steps as to not add many variables to the assay. For example, for Candida strains (which grow faster), we prefer to bypass the agar plate step by making the inoculum directly into the liquid media. Remember that the physicochemical features of the extract or compound to be tested are important to consider. For example, if the extract or compound needs to be dissolved in solvents other than water, must make sure to have an appropriate fungal growth control that includes the same solvent concentration with the fungus alone. This is to guarantee that any growth inhibition observed is not due to the solvent instead of the tested compound or extract. In this case, it might be better to follow the CLSI-M27A3 recommendations for DMSO diluted antifungal drugs, such as dissolving the drug in a concentration at least 100 times higher than the highest tested concentration to reduce the percentage of the solvent in the plate. Regarding stability, it is recommended to keep small aliquots of the analyzed extracts or compounds. By storing the volume necessary for a single assay at the appropriate temperature, excessive manipulation of the aliquot and, if the extracts or compounds are stored frozen, freeze-thaw cycles can be avoided. Finally, one of the most fundamental steps is the accuracy of the microplate serial dilution, given that any pipetting error will be propagated along the consecutive dilutions. Henceforth, pipette precision and proper pipetting techniques are paramount to ensure reproducibility. So, it is imperative to use calibrated pipettes and always check if the volume added and removed from each well is correct. Make sure that residue or vestige from the drug does not remain in the pipette tip. If the compound tends to stick to the tip, it might be better to switch tips between the dilutions. We thank CAPES-Brazil, CNPq-Brazil, FAP/DF for financial support. We are grateful to Dr. Hugo Costa Paes for revising the manuscript. Armstrong-James, D., Meintjes, G., Brown, G. D. A neglected epidemic: fungal infections in HIV/AIDS. Trends Microbiol. 22, (3), 120-127 (2014). Romani, L. Immunity to fungal infections. Nat Rev Immunol. 11, (4), 275-288 (2011). Pfaller, M. A. Antifungal drug resistance: mechanisms, epidemiology, and consequences for treatment. Am J Med. 125, (1 Suppl), S3-S13 (2012). Hancock, R. E., Diamond, G. The role of cationic antimicrobial peptides in innate host defences. Trends Microbiol. 8, (9), 402-410 (2000). Wang, Y., et al. Snake cathelicidin from Bungarus fasciatus is a potent peptide antibiotics. PLoS One. 3, (9), e3217 (2008). Du, Q., et al. AaeAP1 and AaeAP2: novel antimicrobial peptides from the venom of the scorpion, Androctonus aeneas: structural characterisation, molecular cloning of biosynthetic precursor-encoding cDNAs and engineering of analogues with enhanced antimicrobial and anticancer activities. Toxins (Basel). 7, (2), 219-237 (2015). Benincasa, M., et al. Fungicidal activity of five cathelicidin peptides against clinically isolated yeasts. J Antimicrob Chemother. 58, (5), 950-959 (2006). CLSI. Reference Method for Broth Dilution Antifungal Susceptibiliy Testing of Yeasts; Approved Standard -Third Edition. CLSI document M27-A3. Clinical and Laboratory Standards Institute. Wayne, PA. (2008). Guilhelmelli, F., et al. Activity of Scorpion Venom-Derived Antifungal Peptides against Planktonic Cells of Candida spp. and Cryptococcus neoformans and Candida albicans Biofilms. Front Microbiol. 7, 1844 (2016). The European Committee on Antimicrobial Susceptibility Testing. Method for the determination of broth dilution minimum inhibitory concentrations of antifungal agents for yeasts, version, 7.3.1 2017. Available from: http://www.eucast.org/fileadmin/src/media/PDFs/EUCAST_files/AFST/Files/EUCAST_E_Def_7_3_1_Yeast_testing__definitive.pdf (2017). Roongruangsree, U. T., Kjerulf-Jensen, C., Olson, L. W., Lange, L. Viability Tests for Thick Walled Fungal Spores (ex: Oospores of Peronospora manshurica). Journal of Phytopathology. 123, (3), 244-252 (1988). Boedijn, K. B. Trypan blue as stain for fungi. Stain Technol. 31, (3), 115-116 (1956). Goihman-Yahr, M., et al. Studies on plating efficiency and estimation of viability of suspensions of Paracoccidioides brasiliensis yeast cells. Mycopathologia. 71, (2), 73-83 (1980). Tati, S., et al. Histatin 5-spermidine conjugates have enhanced fungicidal activity and efficacy as a topical therapeutic for oral candidiasis. Antimicrob Agents Chemother. 58, (2), 756-766 (2014). Petrou, M. A., Shanson, D. C. Susceptibility of Cryptococcus neoformans by the NCCLS microdilution and Etest methods using five defined media. J Antimicrob Chemother. 46, (5), 815-818 (2000). Zaragoza, O., et al. Process analysis of variables for standardization of antifungal susceptibility testing of nonfermentative yeasts. Antimicrob Agents Chemother. 55, (4), 1563-1570 (2011). Rodriguez-Tudela, J. L., et al. Influence of shaking on antifungal susceptibility testing of Cryptococcus neoformans: a comparison of the NCCLS standard M27A medium, buffered yeast nitrogen base, and RPMI-2% glucose. Antimicrob Agents Chemother. 44, (2), 400-404 (2000). Beggs, W. H. Growth phase in relation to ketoconazole and miconazole susceptibilities of Candida albicans. Antimicrob Agents Chemother. 25, (3), 316-318 (1984). Alcouloumre, M. S., Ghannoum, M. A., Ibrahim, A. S., Selsted, M. E., Edwards, J. E. Jr Fungicidal properties of defensin NP-1 and activity against Cryptococcus neoformans in vitro. Antimicrob Agents Chemother. 37, (12), 2628-2632 (1993).